A concise update just in from Jean-Michel Bois, the ESA Mission Director at ATV-CC working on today’s ATV propulsive support. 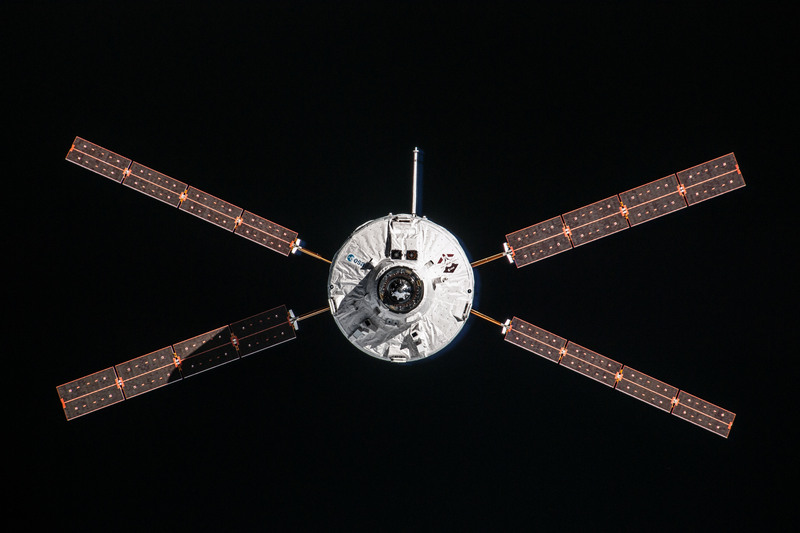 We have been asked to use ATV-5 to decrease – a little – the ISS altitude, by around 1 km. A lower orbit slightly increases the (already tiny) drag exerted by the wisps of atmosphere on the ISS and, therefore, also increases the decay of the ISS orbit. 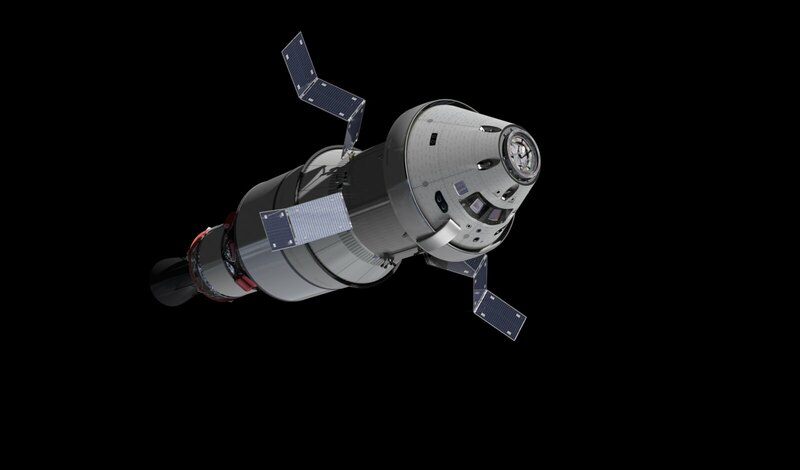 This allows the visiting vehicles (Progress, SpaceX, Cygnus, &etc.) to bring up to Station a heavier load. ATV-5 will be used this afternoon to ‘put on the brakes’, reducing the speed of the ISS so that it consequently will drop to new lower, but stable, orbit. The boost (in this case, ‘deboost’) has a value of 0.68 m/s and is planned to run between 18:40:00 to 18:44:49 UTC (19:40:00-19:44:49 CET). It is the first time that an ATV has been used to decrease the altitude; usually, on the contrary, ATV propulsive support is used to lift the orbit due to the regular decay (around 1 or 2 km per month). 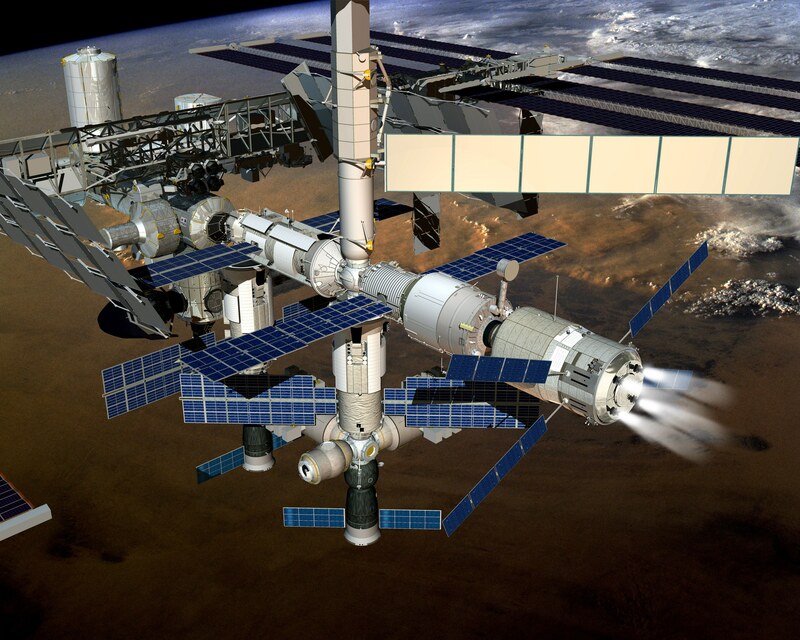 To allow this manoeuvre, the ISS has been turned 180 degrees so that the ATV, docked to the rear, is in front of the other modules with its thrusters directed opposite to the Station’s velocity vector. Editor’s note: As pointed out by Steven Pestana, ATV-1 did conduct a similar ‘retro’ burn in 2008, as part of a debris avoidance manoeuvre; we’ll ask the team at ATV-CC for details and results later today. The ‘deboost’ ran 4 mins 49 secs. Specifically, the this was required to set up phasing for 58 Progress (58P) to do a 4-orbit rendezvous on 17 February. The delta velocity for the burn was -0.69 m/s, and the apogee came down by 2.5 km. The deboost was required to place the Station at the correct altitude for the proper phasing for the single-day launch-to-docking profile for the Russian ISS Progress 58 cargo craft that launches Feb. 17. The Station’s altitude was lowered by 1.5 statute miles at apogee (no change at perigee) to meet the phasing requirements for Progress, which is carrying 3.1 tons of food, fuel and water to the Station. ATV has been used in the past for manoeuvres or reboost of the ISS, but the volume of the cargo being carried this time by Progress required a slight lowering of the station’s altitude. 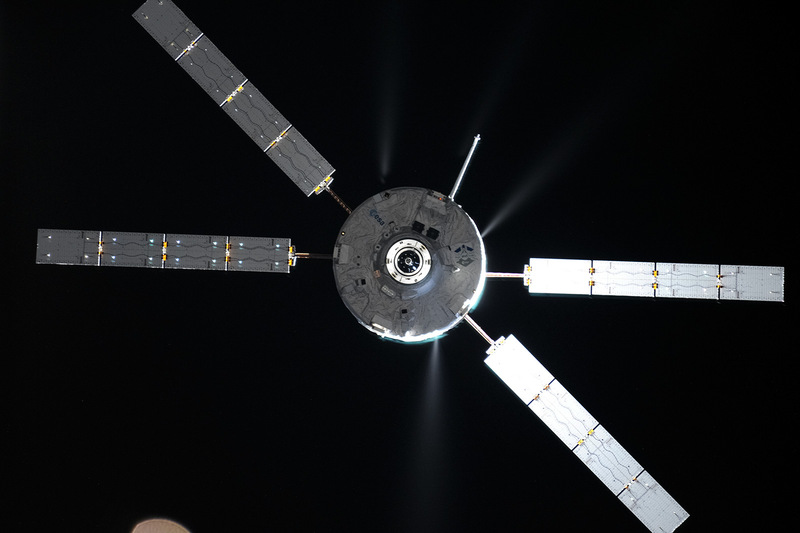 96 kilograms of fuel were used by ATV-5 for the deboost Wednesday, leaving ATV-5 with about 350 kg of propellant that it will carry in reserve when it undocks on Feb. 14 for its eventual deorbit on Feb. 27. Is this enough of a change to effect the amount of time it takes for it to complete one orbit? Thanks… OF COURSE; you are correct! Fixed…. Can someone explain how reducing the ISS altitude by 1 km will allow heavier cargo to be delivered by Progress, SpaceX, Cygnus. Also, if regular orbit decay of 1 to 2 km per month has to be corrected, why is this a more stable orbit. Thanks. Is this the first time an ATV has been used to lower the orbit of ISS? What about this debris avoidance maneuver? I think the team at ATVCC make a distinction between propulsive support provided for a DAM versus for a planned orbit change (even if it looks sorta the same to us). We’ll ask them! Where will ATV-5 reenter the Earth’s atmosphere and what trajectory will it be on? Is Feb 9th still a good de-orbit date?